Many of us understand that one of the most important things that can be done for your finances is to save for retirement. Getting started early is one of the best ways to take advantage of compound interest and build a nest egg that can handle just about anything. It’s important to consider how much you are setting aside because you might be surprised at how much it will cost you to live during retirement, especially if you factor in your health care costs. One of the things that many people overlook as they save for retirement is the importance of including stocks in the portfolio. It can be difficult to feel confident about stocks in your retirement portfolio when you pay too much attention to the headlines and worry about when the next crash might come. As you can see, using a savings account, or even just putting half your money in savings and half in stocks, you won’t come close to what you can accomplish with a large amount in stocks. Even if you back off a little bit to adjust your asset allocation to include more bonds as you approach retirement, you’ll be in better shape if you use stocks in your retirement planning. One of the biggest reasons that investors cite when it comes to avoiding stocks in a retirement portfolio is the risk. Many people worry about the risk involved when you use investments — especially when they have been through events like the crash in 2008 and 2009. However, the reality is that there are ways to reduce your risk. Indexing can be one way to give your retirement portfolio a stock boost without taking on the risks that come with stock picking. Index funds are collections of securities that follow as specific stock index, such as the Russell 2000 or the S&P 500. There are even all-market index funds that offer exposure to every publicly traded security available. This means that, instead of worrying about whether or not you have picked the “right” stock, you have the advantage of the overall performance of a group of stocks. Over time, stocks tend to come out ahead, with the market not losing in any period of 25 years. So, even if the trend line looks volatile month-to-month, and even year-to-year, over decades it smooths out to show growth. When you use index funds (or index ETFs) in your retirement portfolio, you don’t have to beat the market at all. You just have to ride the wave and perform as well as the market. When you combine this reality with long-term dollar-cost averaging for 20 to 40 years, you don’t have to worry about investing as much as you thought you would. If you start in your mid-20s, investing $200 a month consistently for the next four decades is likely to result in an adequate nest egg. If you are older when you start, you need put in more. 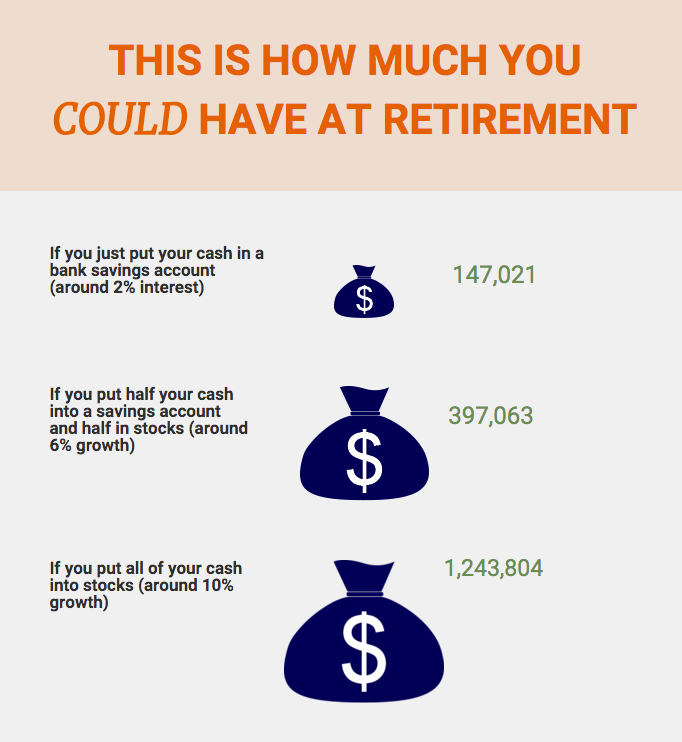 For example, using the retirement calculator at Calculate My Wealth again, you can see that starting at age 35, and putting in $400 doesn’t yield the same results if you want to retire at age 65. Even investing in all stocks can’t make up for the lost years of time. Don’t let recent events and sensational headlines keep you from building wealth over time. You can probably afford to start investing now, and you need to make sure that stocks are a part of your retirement portfolio. If you want to limit your risk, try indexing — at least to start — in order to avoid the problems that come with stock picking. As the market begins to dip I am buying happily. I got a bit panicked on the last downturn we had and I am suffering because of it. It really is a good idea to always have SOME amount of stocks in your portfolio. It’s clear that a healthy mix of stocks and bonds are the only way to go for long term retirement savings. In our current zero interest rate environment (ZIRP), your figures would look even more slanted toward stock investing! When it comes to retirement I think we should save as much as possible. Unexpected costs and inflationary costs are unknown in the future. I read a lot of financial blogs where the blogger announces they are retiring on dividends. Sadly those bloggers are only thinking in the present. They just make enough to survive now, which is short-sided. What about health care costs or new expenses. For example when my grandparents budgeted their retirement expenses, items like Internet access, cell phone bills, etc. didn’t even exists. Great post! But I would say even some of those rates of return in today’s environment are high! Going to be challenging times ahead I think. Expect 4-6% real returns from stocks for the next decade or so, I bet. Hard times! But thanks for the article! I am a huge fan of using the stock market to make outsized gains in my portfolio. I love the ease in which to buy and I like the history of stocks going up on average of 7-8% a year. It gives me comfort knowing that even if we have a huge recession that stocks will bounce back a couple of years later. I really appreciate your insight. Thanks for sharing!!! 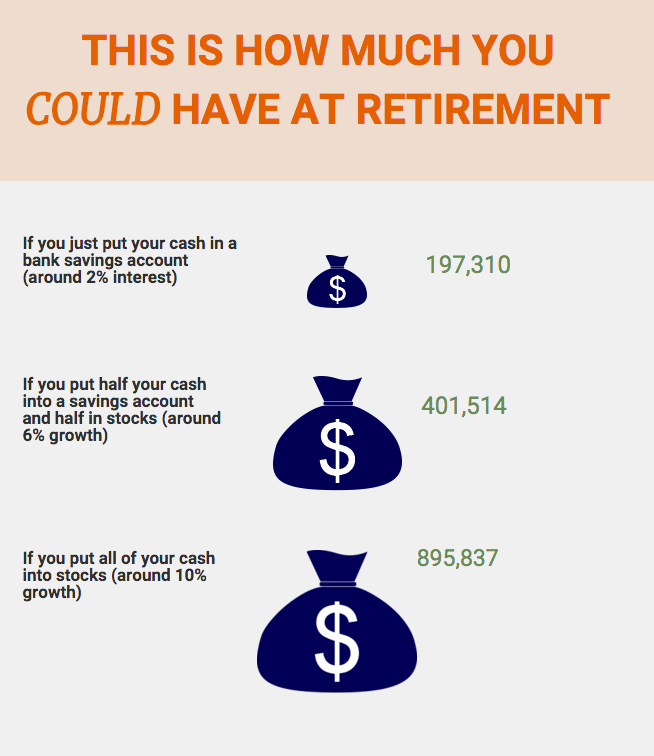 I wish I would have run across this type of information in college vs. really only recently understanding the true power of compound interest that can come with stock investing. It is never too late to start investing in stocks, but the earlier the better! The earlier you start, the less you need to invest every month. This is something to teach our children. ….and do you know what the worst thing about the whole saving for retirement project is? When employees put into a pension the default fund is usually a mixture of various bonds with a small allocation for stocks. Most people don’t know any better and never change it. I wish people could see these simple images you’ve included in order to see how much money they’re losing out on. I think that change needs to happen worldwide. Default pension funds should be fully invested in stocks if you commence investing at any aged before 40. Thoughts?